The story of Roxie Hart and Velma Kelly has been told time and time again in the form of musicals, Broadway shows and films, but it began as a play written by a Chicago Tribune writer who spent part of her career chronicling the cases of the real life Roxie and Velma. Maurine Dallas Watkins moved to Chicago in 1924 and landed a job with the Chicago Tribune as a cub reporter. During her 7-month stay with the paper, she covered the stories of women she dubbed the Merry Murderesses — 14 women who were imprisoned at the Cook County Penitentiary on charges of murder. 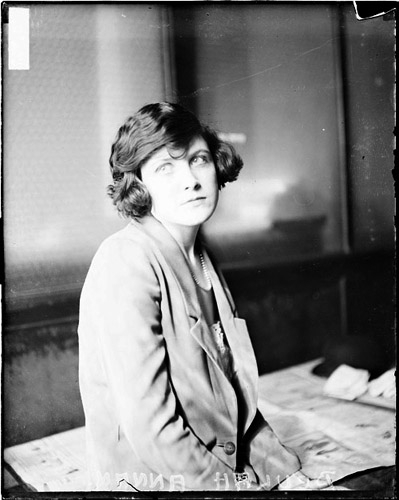 The prettiest, and most notorious, of these murderesses was a 24-year-old named Beulah Annan. Beulah made headlines when she shot her lover Harry Kolstedt and then sat listening to the song “Hula Lou” for hours afterward. 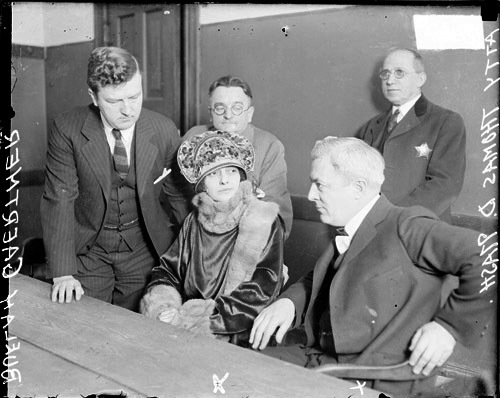 Her story changed over time, from drunken murder to self-defense, but her husband Albert famously stood by her side during the trial. Once she was acquitted, however, she divorced him. Just a month before Beulah had murdered her lover, 40-year-old Belva Gaertner was arrested under similar charges. Dubbed the most stylish of the spouse slayers, Belva was accused of shooting her lover Walter Law while the pair were driving around the city. When the dead body of Walter was found in her car, she admitted they had been driving drunk, but she claimed she couldn’t remember what had happened. Although she, like Beulah, was married at the time of her affair, Belva and her husband were separated at the time. Despite that, the pair stayed married until his death some years later. Belva, like Beulah, was acquitted of all charges. Although Maurine left her position as cub reporter after just 7 months, the stories of these modern day Salomes stuck with her. 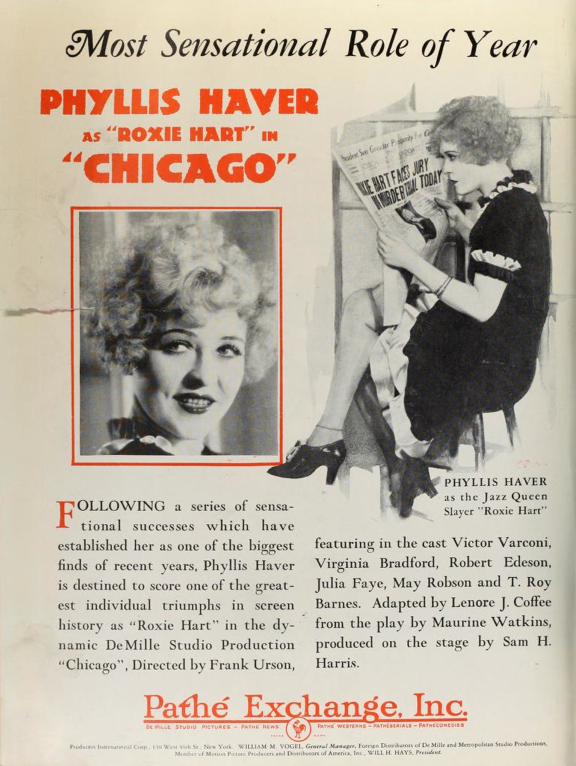 While taking a writing class at Yale University, she penned the first iteration of the story of “Chicago.” The story was based on the trials of Beulah and Belva in particular, with Beulah providing the inspiration for Roxie Hart and Belva inspiring the character of Velma. She turned the story into a play called “Chicago, Or Play Ball” and it opened on Broadway on December 30, 1926. Hey, that isn’t Queen Latifah. For years, this first film adaptation was difficult for audiences to view, causing it to become largely overshadowed by later adaptations. Recently, though, the team at Flicker Alley acquired and released a fantastic restored print on DVD . Fandor has also acquired the film and now streams it on its site. Take the time to seek out this forgotten gem and experience the story of “Chicago” from a time when it was still fresh in the minds of those living in the Windy City. Thank you to Janelle for this wonderful Silent Film Series. You can read more of Janelle’s articles about Silent Film and Chicago history-related topics at Chicago Nitrate or Curtains, or you can follow Janelle on Twitter at @SpookyJanelle . This entry was posted in Posts by Janelle Vreeland, Silent Films and tagged cecil b. demille, chicago, classic film, Classic Movies, Phyllis Haver, roxie hart, the real story of Roxie Hart and Chicago, velma kelly. Bookmark the permalink.